When would I use this feature? If you're transferring to Pandle from another system and have a significant number of customers and/or suppliers, then you can use the Importing function to import their details quickly. Additionally, you can import all of your previous invoices into Pandle from your start date in Pandle. NB: If you have transactions before your start date, then opening balances will have to be entered to account for them. 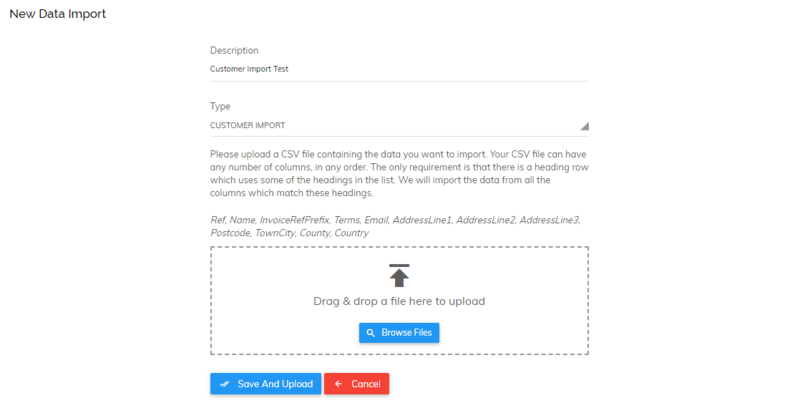 To import your customer/supplier details, you'll first need to export your customer/supplier details as a CSV file from your previous accounting software (or save them as a CSV format if using Excel). Once exported, this file can then be imported into Pandle. We've created this short video which walks you through how to add or import customers in your Pandle account. Below you'll see how to import customers. Please note that supplier details can be imported via the same process. However, these are accessed from the Suppliers tab, rather than the Customers tab. To import go to: Enter Transactions > Customers > New > Imports. Give your import a name (to distinguish it from other imports), select the type (Customer Import) and drag and drop your file in the selected area or click 'Browse Files' to locate it. For Pandle to be able to read the information in your import, you will need to edit your CSV file and alter the headings. The full list of headings readable by Pandle can be found in the image above. Pandle will ignore any columns without these exact headings, so it's important to use capital letters where shown. Please note: if the AccountRef in your CSV matches the customer reference in Pandle, then the relevant customers will be pre-populated in the next step which will save a lot of time. Once your file has been imported you will be presented with rows of current and previous imports. This will show you how many draft entries are contained in the import and how many entries you have confirmed. Each entry needs to be confirmed by you to ensure it is correct. To do this, simply click on the green tick button to 'Check and Confirm'. You can then review each customer and check that the data has been imported correctly. To check the addresses, simply click on the envelope icon. Once you're happy, you can click the checkbox next to each entry (or the heading to select all) and then 'Confirm Checked Customers'. Your customers/suppliers will then be live in Pandle and ready for invoicing! If you create your invoices outside of Pandle or you want to import all your invoices from a previous period you will need to have your invoices listed in a CSV file. To import these go to: Enter Transactions > Customers or Suppliers > New > Imports. The remainder of the process is identical to importing customers, shown above. If you would like to upload split invoices, you simply need to enter the same value for 'InvoiceRef' for each line item (split) within the invoice. If there is a value for 'AccountRef' on any of the lines it will need to match across all of the lines in the CSV.